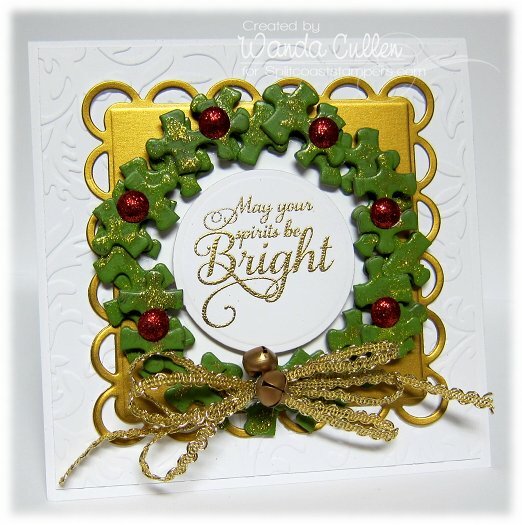 So ironic that I had a blog update in my inbox with a link to Betsy Veldman's Chalkboard Technique for PTI's Make it Monday challenge and then I checked out the Technique Lover's Challenge on SCS and saw Joan had posted the same technique. I've been wanting to try this for some time, so this was definitely a sign that I had to play - lol! 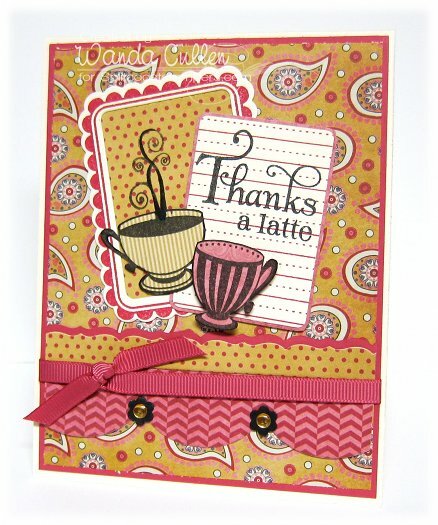 This sentiment from Verve's "Learning to Sail" set was perfect for the main focal panel! I white embossed on black CS then sponged Colorbox "Frost White" pigment ink along the edges and brushed some ink on the "storms" word. 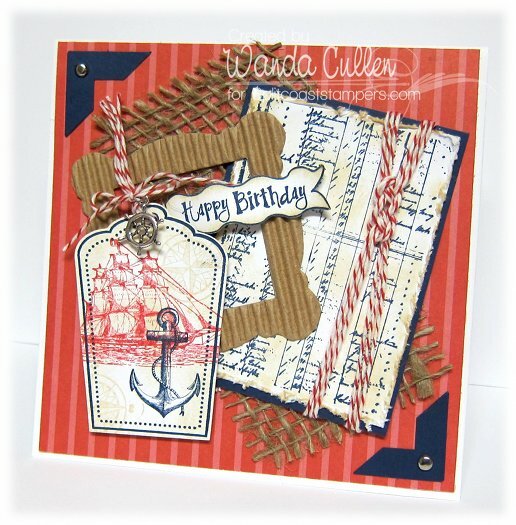 A nautical charm added to the baker's twine finished off the card which uses Jen Shults' fabulous layout for her current Deconstructed Sketch Challenge! Happy last day of the year! 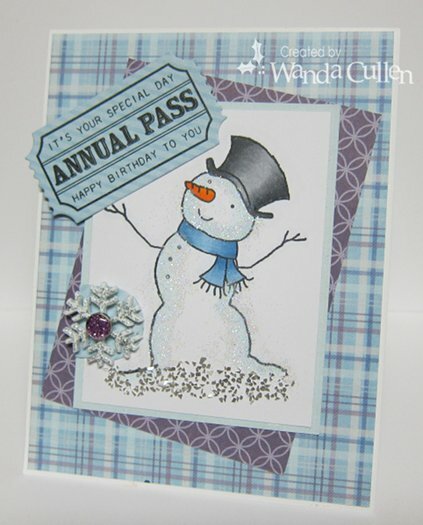 That also means it's square or round cards only for the Mojo Monday Challenge where Carole Burrage has a great sketch on board! 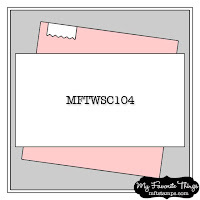 I went with a 4 1/4" square card which easily fits into an A2 envelope. I had fun coloring up this sweet little bouquet of hearts with Copics and a Lipstick spica glitter pen! 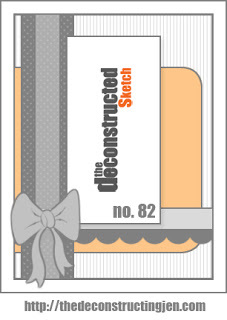 I thought this Cherry Cobbler ribbon matched the DP well and added a tiny sentiment on the chipboard tag. So, c'mon and play with us! For more inspiration by the other mojomakers, swing by the Mojo Monday blog and check it out! 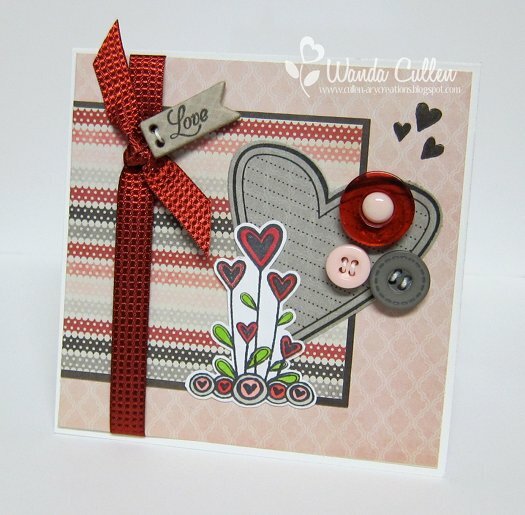 STAMPS: Love Notes (hearts), No Matter What (heart bouquet) - both by Verve; Tiny Tags (sentiment) - by PTI. PAPER: Lost and Found 3 "Ruby" pad by MME, White (PTI). 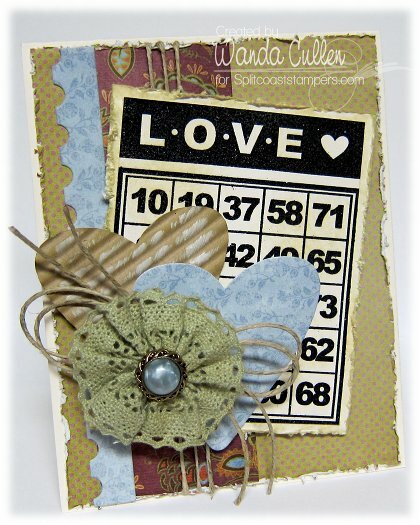 ACCESSORIES: Cherry Cobbler ribbon (SU), Jotted Heart die by Verve, Decorative buttons, chipboard tag and enamel dot by MME. Hard to believe the cogs have turned and another year has rolled by! I'm enjoying these weeks off work and have gotten to play in extra challenges that I normally have to pass up. 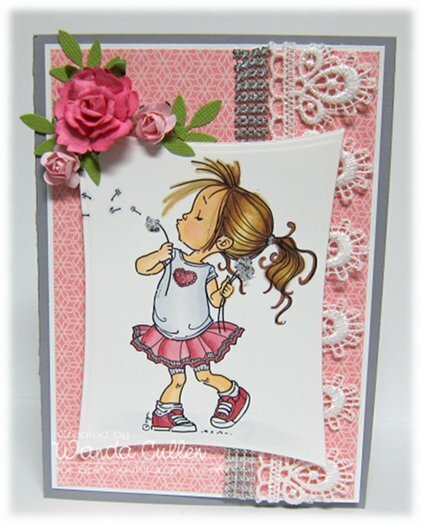 This card uses the latest Retro Sketch and is also for the Just Us Girls Challenge to use sparkle along with a new year's theme. I went with red and silver glitter CS to die cut the stars and embossed the watch using silver EP to add some extra shine. I can never capture glitter in my photos, no matter which angle I try! This is my first time inking up this Clockworks stamp set by SU and realize I should NOT have used a textured red paper as the image in the BG didn't show up clearly. Live and learn! 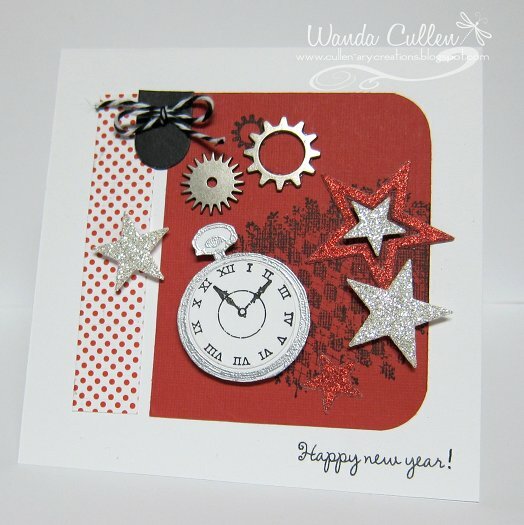 I added a couple of Tim Holtz' sprocket gears and inked up a portion of a Verve sentiment from the Merry and Bright set. November 2011 was my last month to be part of the dirty dozen design team. When they tell you the 6 months go by quickly, they aren't kidding! That month's theme was "Child's Play" and we were challenged to channel our "inner kid". I have great memories of rainy day family time putting puzzles together! This was also my favorite card for the month. I'm always amazed that children can find the simplest of things and consider it play time! A reminder of the game "button, button, who's got the button?" Growing up in northeastern Ohio, my brothers and I had plenty of opportunity to play in the snow...building forts and snowmen, having snowball fights, making snow angels, etc. My children had a number of collections when they were young which gave them many hours of play time...Micro Machines, Beanie Babies, rocks, annual Christmas ornaments, Pogs, sea shells, etc. So, this ornament is a reflection of that play time memory. That's the end of my dirty dozen time on memory lane. Thanks for walking with me. I'm back with cards from the Dirty Dozen theme for October 2011: Weather or Knot. The dirty girls were feeling punny that month and were inspired by anything related to weather and/or the word "knot" (bow as focal point, tie the knot wedding theme, decorative knot, etc.). A knot is also a nautical term for the division on a log line used to measure the speed of a ship. When I first heard the challenge theme, I knew I wanted to do a collage from images in this SU set and incorporate a sailor's knot as well. 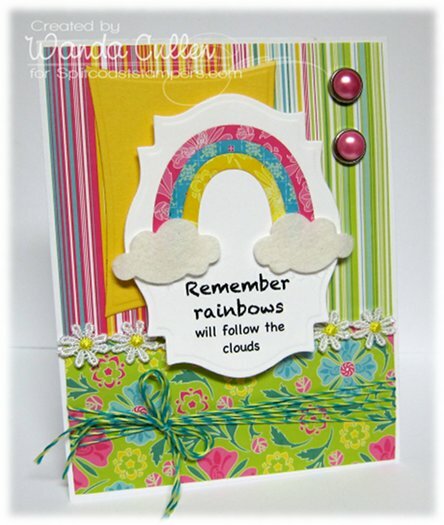 Rainbows will follow the clouds! 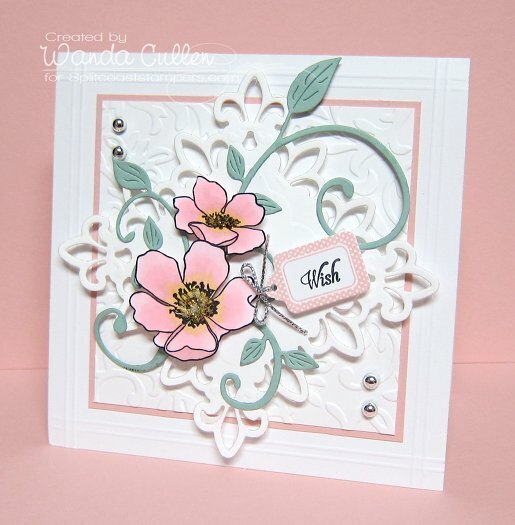 This card was inspired by a gorgeous card created by Leslie Miller - unfortunately, I don't have a link to her card, and it was also inspired by that month's lovely inspiration photo. 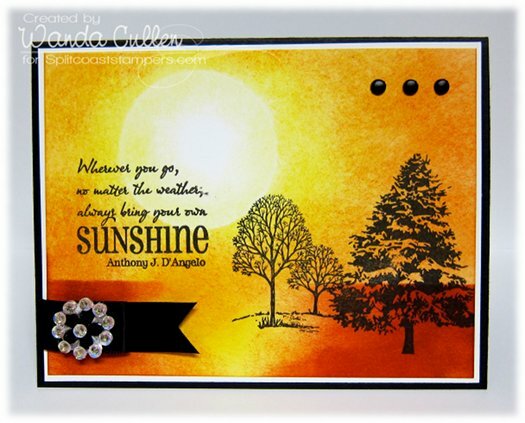 I loved Leslie's idea of stamping a silhouette over a sponged sunset BG and knew I wanted to use this technique with this great sentiment! That's it for October DD creations...thanks for stopping by! Coming to the end of the year, I suddenly realized I only posted cards/projects for 3 months of the 6 that I was on the DD team! With having to wait to publicly post at least 6 months after the assignment, I lost track of my posts. :-) So, here are my creations for September 2011's theme: "Comfort Zone". We all have things we go to for comfort - foods, clothes, destinations, friends, family, etc. - and we were to draw inspiration from those things. Let's eat cake! I'm especially comforted if it's chocolate cake - lol! No, I do NOT find comfort in snowy weather, but this image was inspired by our inspiration photo for that month. Isn't it comforting to know every day is a special day given to us?! No matter how much we screw up...we can take comfort that God will give us a new day and is there with us to make it better! 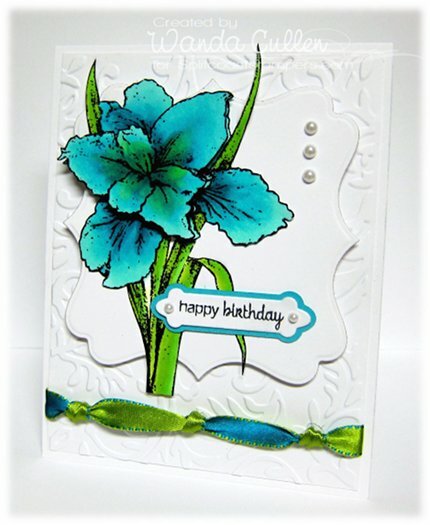 My comfort zone in papercrafting is using floral designs, dies, tags and Copics. Ahhh...nothing like the comfort of a hot bath following by some silky lotion! I love the comfort of a warm, handmade quilt, so this was the paper version of "quilting". Last but not least, I can find the greatest comfort in my faith! So, there you have my September entries...stay tuned for more dirty creations! 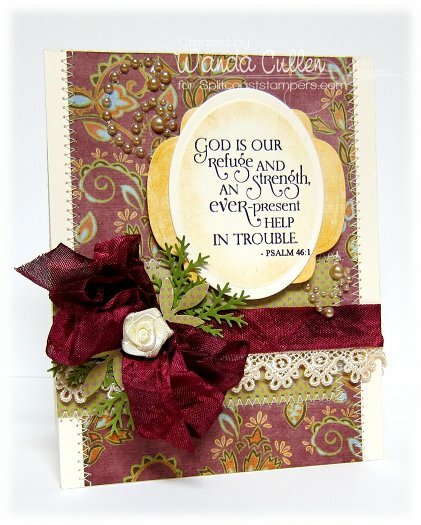 Trish has a fun challenge for this last of the year Queen for the Day Challenge on SCS! We are to look at the year's list of queens and find the one that was closest to our birthday and CASE a card from that queen's gallery. 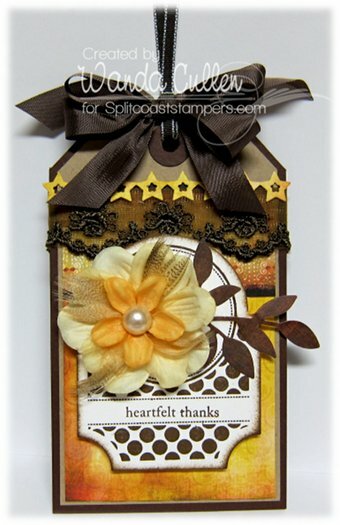 LilLuvsStampin (aka Charlene Merrick) happened to be queen exactly on my birthday - April 12! 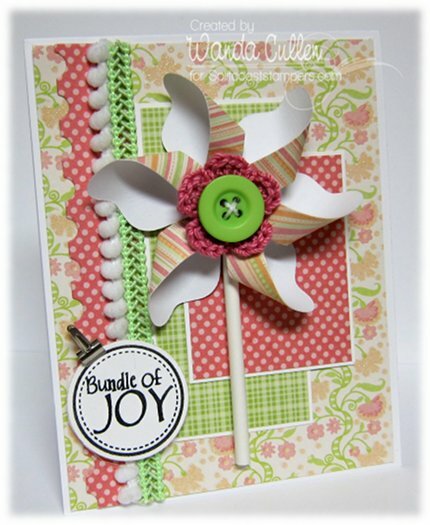 Charlene also became a dirty girl this year, so I had a tough time narrowing it down to a single card to CASE, but finally went with this beautiful CARD in pink and green...one of my fave color combos! 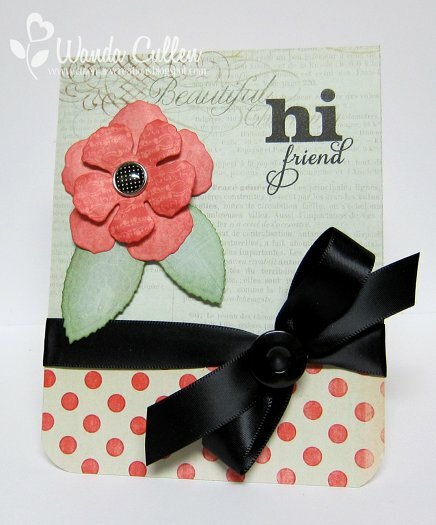 I loved her bold pop of black in the ribbon, so kept that element. 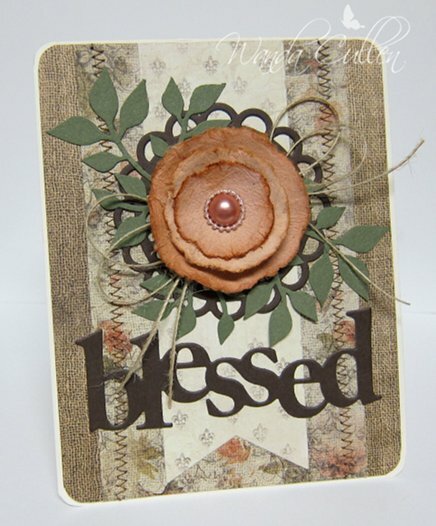 Instead of a prima, I made a flower using the Rose Creations dies from Spellbinders, sponged the edges with Cameo Coral and Sage Shadow - two retired inks by SU. 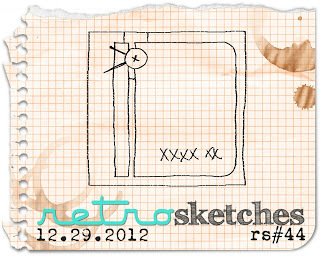 Papers are from MME's "Market" pad - mounted on a Vintage Cream base. Sentiment is from Verve's "Lean on Me" set. Once again, I'm honored to celebrate Charlene as my birthday queen! 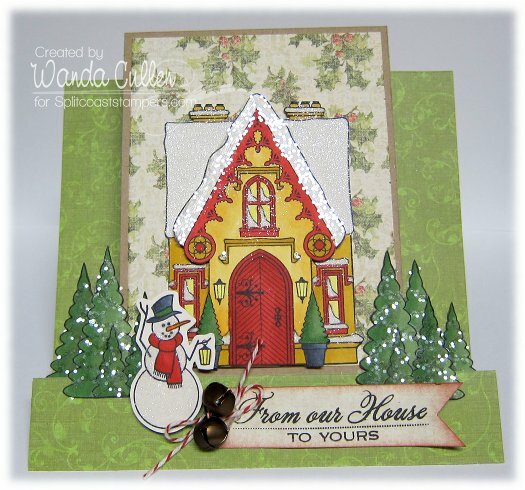 There's a new CASE Study Challenge - last one for the year - and the inspiration is another beauty by the current talented muse, Windy Robinson! Large pearl flourishes and I don't get along well, so I opted for the smaller scale random pearl accents. It's hard to see in the photo, but I loved the way she layered the two white panels for a subtle added dimension! I used a new border die from PTI...perfect for any love-themed card. Sun is out today...yippee! Think I may venture outside the house for a change from yesterday! 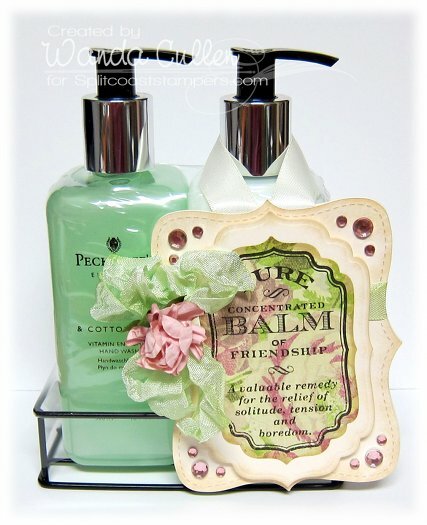 STAMPS: Stronger Love (sentiment), Bloom & Grow (leaves) - both by Verve. 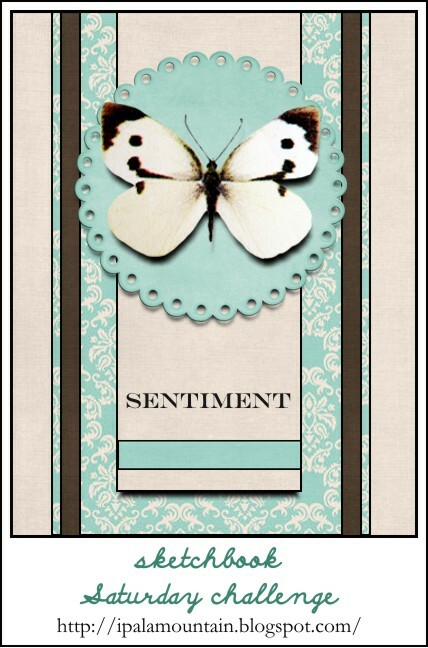 PAPER: Springtime Vintage DP by SU, Vintage Cream (PTI). 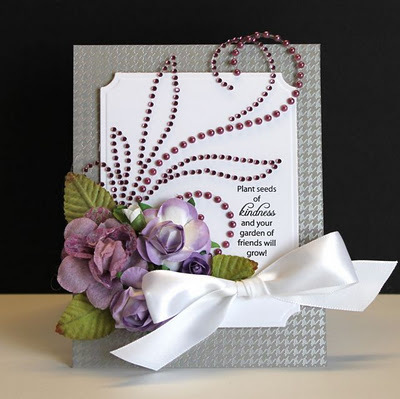 ACCESSORIES: Black EP, Corner scallop punch, Kaiser latte pearls, Elegant leaves die by Verve, Fine Linen satin ribbon by PTI, Buttercream paper bloom by Kaisercraft, XOXO border die by PTI. Blessed pretty much sums up my feelings as I look back over the past year! It hasn't been all roses, but when I remember the tragedies - both worldwide and locally in family and friends' lives, I truly do feel blessed! This Glitz paper pad has been in my stash for MANY months and I haven't touched it until now. Not sure why because I love the soft earthy tones! 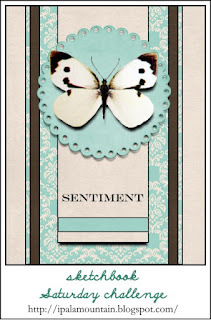 PAPER: French Kiss by Glitz, Early Espresso & Always Artichoke (SU), Vintage Cream (PTI). 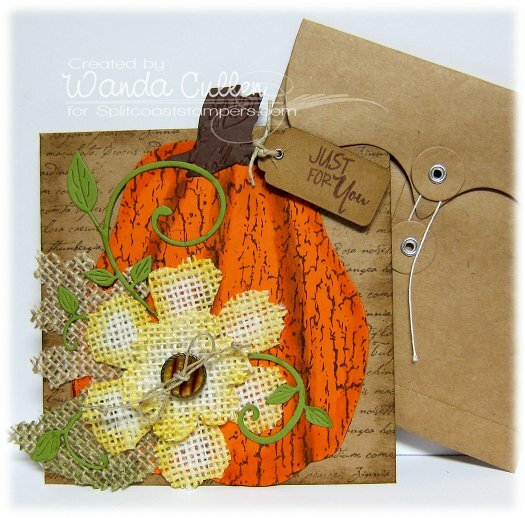 ACCESSORIES: Doily Die-Namics by MFT, Die-Namics Fishtail Flags STAX by MFT, Sentiment die by PTI, Branch w/Leaves die by Sizzix, Jute twine, Prima by Prima Marketing. We had a partly sunny, balmy Christmas day in the low 50's, but today is a different story! Woke up to snow covering the ground and it's still coming down after changing to sleet late morning! It's a day when I decided I would stay in my warm fleece robe! 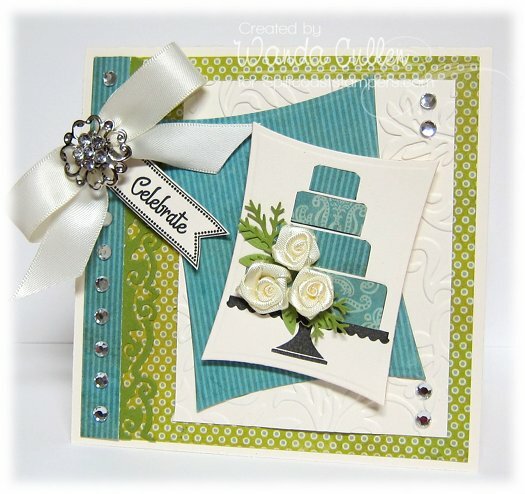 I've missed my stamping routine, so wanted to play along with MFT's Wednesday Sketch Challenge. 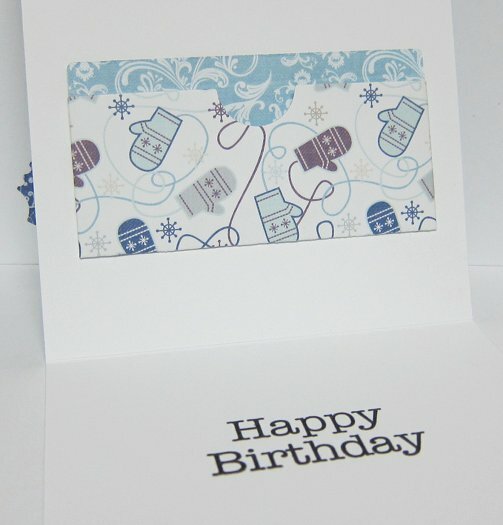 As you can see, I flipped it and made it an A-2 sized card. With inspiration from the snow outdoors, I chose to ink up this new PI image from MFT, colored with Copics and added some glitter. 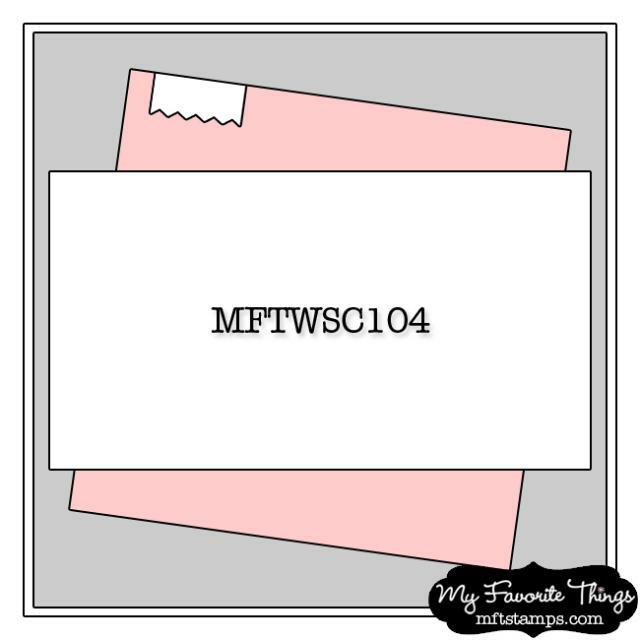 The inside has a gift card pocket which will hold a movie GC for my brother who is having a birthday on the 31st. 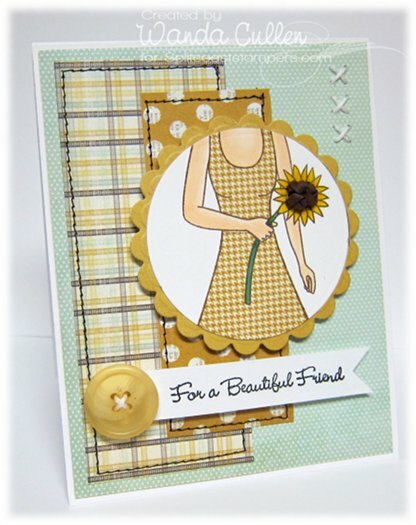 Love this new GC die by MFT...so much quicker than the old DIY method. 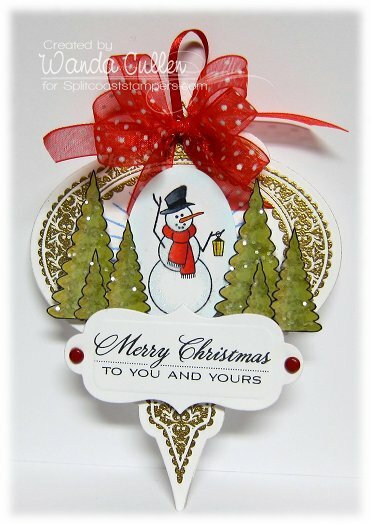 ACCESSORIES: Die-Namics Rounded Banner STAX, Card Pocket Horizontal and Ticket die by MFT; Snowflake button and brad, Glitter, Copics. 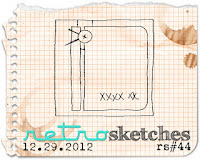 Twas the day before Christmas and all through the blog, the mojo was flowing while drinking eggnog! LOL...actually, I hate eggnog, but it was the only drink that rhymes! Teresa has a fun Mojo Monday sketch for us and I simply couldn't do another Christmas card, so went with a theme of hearts instead. 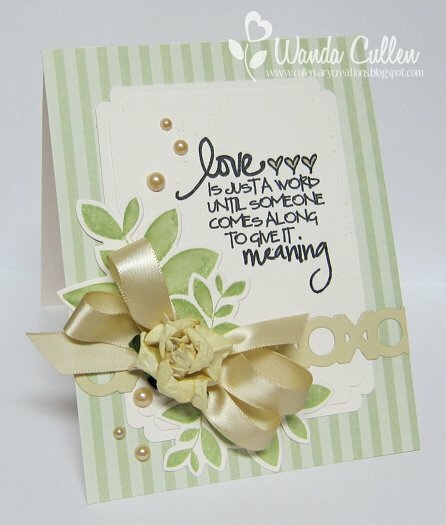 There are so many wonderful sentiments in the "Stronger Love" set by Verve! 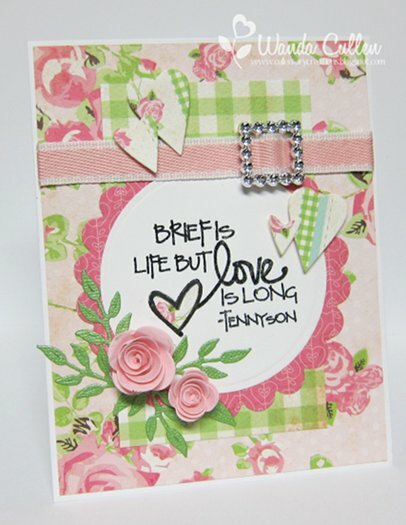 I made this Tennyson quote the focal point and added some die cut hearts, rolled roses, ribbon and buckle bling slide as accents. Don't miss the inspiration by the other mojomakers. Head on over to the Mojo Monday blog and check them out! Can't wait to see what you create! 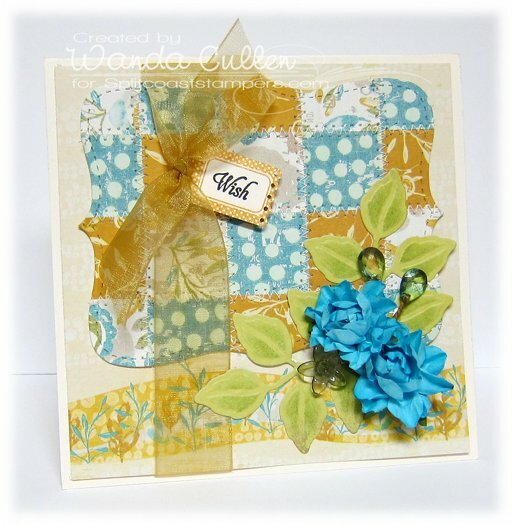 PAPER: Vintage Marketplace DP by Bazzill Basics Paper; Avalon DP by Bazzill Basics Paper. 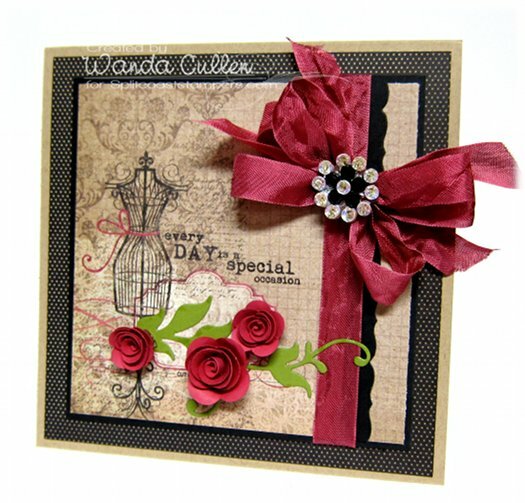 ACCESSORIES: Black EP, Circle and Scallop Circle Nesties, Blushing Bride ribbon by SU, Rhinestone slide, From the Heart dies by Verve, Mini rolled roses Die-Namics by MFT, Fern leaves die by Cheery Lynn Designs.